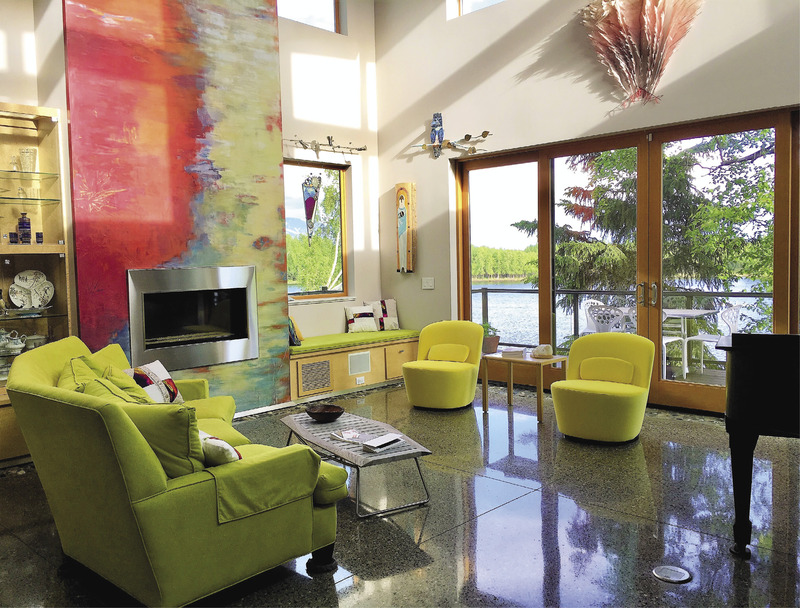 When Linda Kumin began planning her home on Sand Lake, she wanted something dramatic that embraced the environment around her. 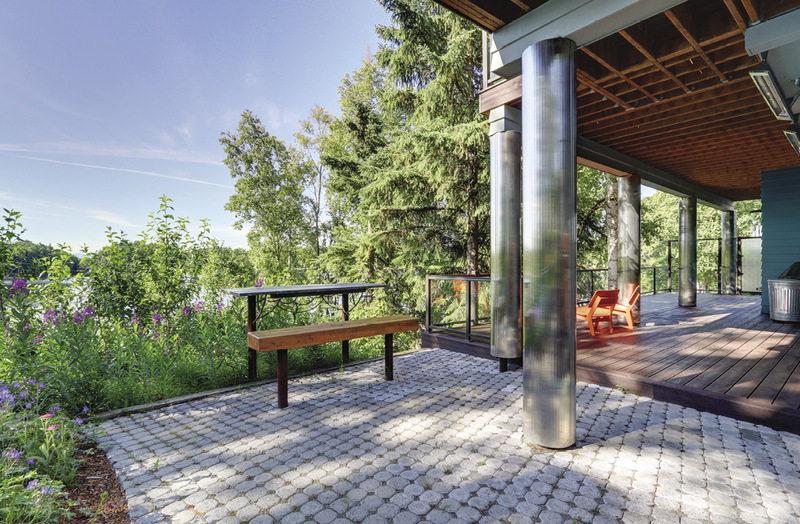 “Linda really wanted a home that spoke to nature,” says Danelle Seetomona of MX&B Development. With the eagles, ravens and other birds living on the lake, the butterfly roof was chosen to resemble a creature in flight. The shape and numerous windows also capture the low-angle light that shines in during winter. The challenge with the shape was designing it in a way that provided Linda with all of the spaces and views she desires, says Petra Wilm of WilmWorks. Linda doesn’t just view her community from the outside, though. 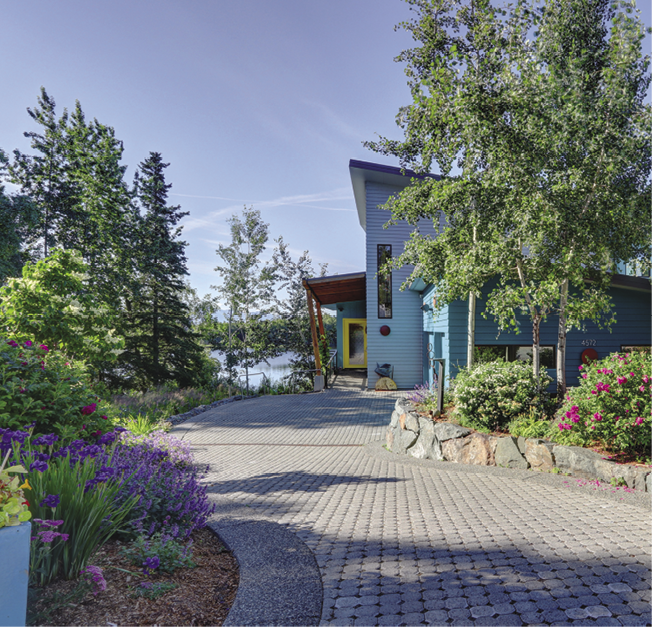 Her home was designed to meet any guests’ needs, and accommodate her lifestyle at any age. It has wide, four-foot doors for not only the aesthetic, but so anyone with a cane or a wheelchair can move about the house without having to squeeze by, explains Petra. This feature also lets Linda “age in place” in her custom-built home. “For aging in place, we try to make it so that your general flow through the house is as much on one level as possible, so it’s only auxiliary spaces, like guest rooms or specialty rooms, that are on the other floors,” Petra elaborates. Whether entering from the garage or the main door, you don’t encounter stairs through the main area of the house. Having an accessible, open main floor with unobstructed views and guest bedrooms above, however, is a feat of engineering, requiring many cantilevers. “Some of the rooms are basically floating,” says Danelle. There was even a point partway through construction where the team pushed out a window of the guest room to create a reading nook with a view of the mountains for Linda’s grandkids. Terry says their engineering team said it was impossible. After working some plans with extra support beams and talking it over with Petra, they found a way to make it happen. “The real hero is the contractor who’s not telling you ‘no, you can’t do that,’ or, even worse, ‘that’s not how we usually do it,’ ” says Petra. 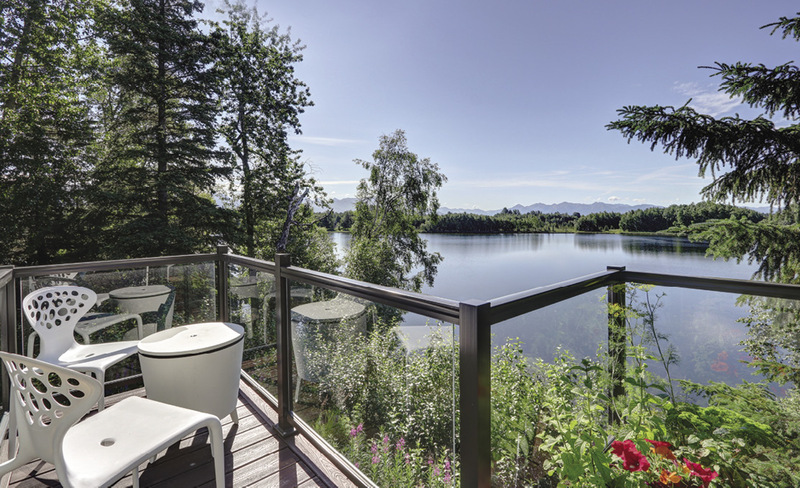 “The end result of the project was not a compromise – it turned out the way we envisioned. It was really satisfying watching those engineering feats come to fruition.” These heroes’ hard work makes Linda's home the perfect space for community gatherings. “We actually got a grand piano so we could have groups come over like the opera, the concert association, the Spenard Jazz Fest,” says Linda. Whether they’re putting on a fundraiser or giving thanks, the space has everything. Guests can enjoy the grand piano without noises from the planes, people or wildlife outside since the walls are built with special insulation and concrete paneling to be soundproof. 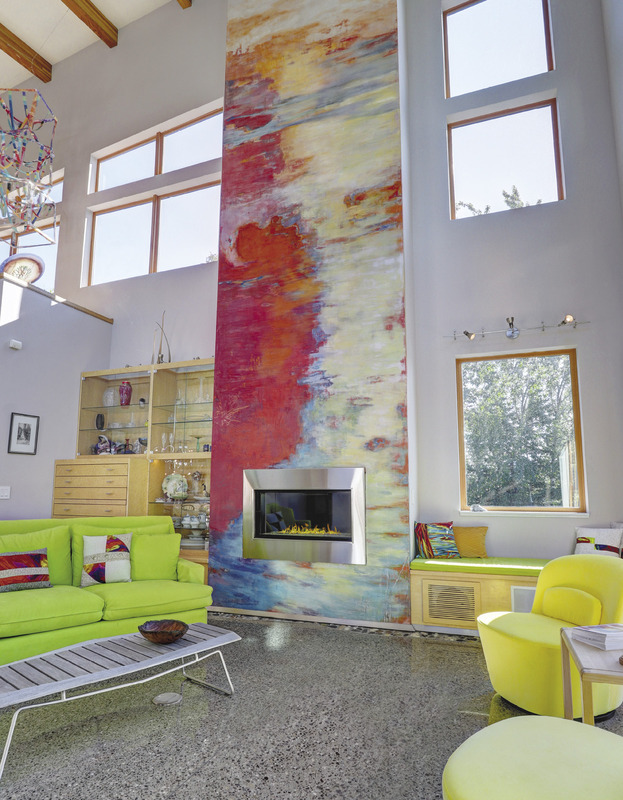 Near the grand piano is a massive fireplace with a beautiful, colorful mural commissioned from artist Rebecca Spivack. The fireplace acts as a focal point to the room, bringing in pops of color that can be seen throughout the house, from the brightly colored couches and chairs in the living room to the art on the walls and the exterior furniture. In the colors can be found flecks of jade, opal and even gold from the radiant heated concrete flooring, specially mixed by MX&B with Alaska stones. 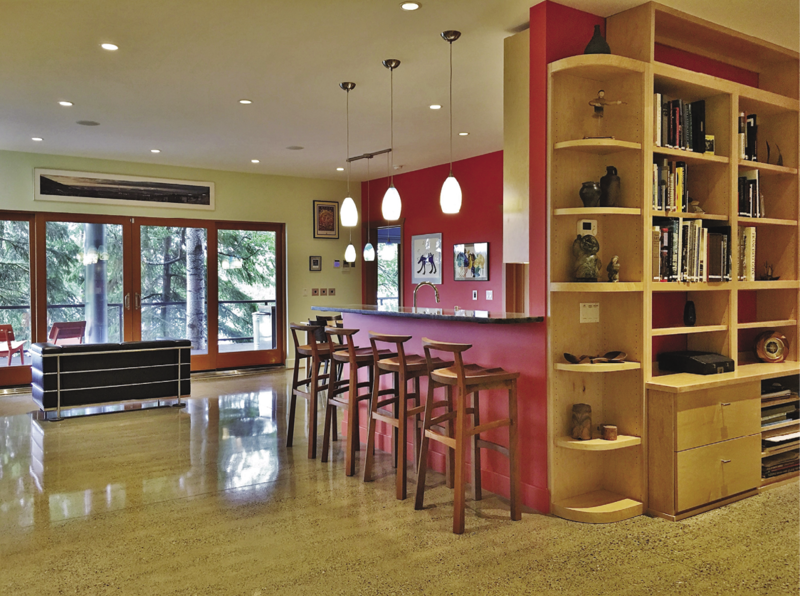 “We ground it down, and it gave it that terrazzo look,” says Danelle. Along the walls of the main room are small rocks laid into the concrete. “Linda and her daughter took their sailboat out for an adventure at Bulldog Cove and collected buckets and buckets of rocks,” says Danelle. Terry Seetomona of MX&B explains that to achieve this, Linda placed the rocks in the concrete right after it was poured to create a “riverbed” look. Another subtle, special detail like this can be found in the kitchen. During construction, Linda had her close friends and family over for a “blue bottle” party, where guests brought drinks in blue glass bottles to toast to the house. “We took the bottles to a glass cutter and sliced each into rings. (Then the builders) placed those rings into the cement countertops,” recalls Danelle. These blue rings perfectly match the blue, energy-efficient Viking and Sun Frost appliances that Linda and her daughter use to whip up delicious appetizers and cocktails for their parties. 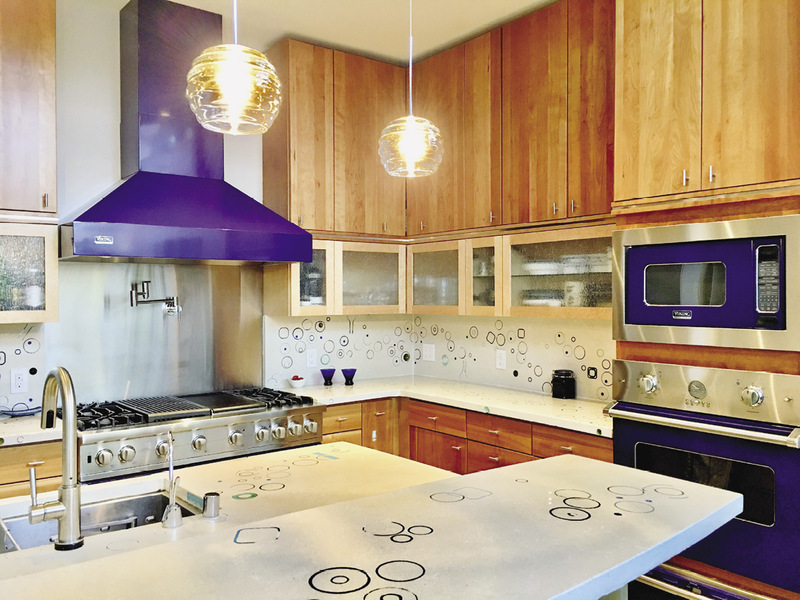 With their butler pantry, built-in cookbook shelving, extensive bird’s eye maple and cherry cabinets, and wood-burning Tulikivi stove, the kitchen is well-equipped to serve any visiting Anchorage organization.